Posted on March 20, 2018 at 9:00 am. 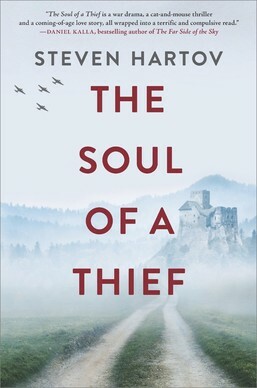 The Soul of a Thief is the latest book by author Steven Hartov, set during World War II…but it is so much more than a war story. Keep reading to discover more about this fantastic book and to win a copy of your very own. What is your new novel, The Soul of a Thief, about? The Soul of a Thief is an adventure, a war story, a romance and a coming-of-age novel, all set during the year of the Allied invasion of Europe during World War II. The story centers around a 19-year old Austrian boy of partial Jewish heritage, Shtefan Brandt, who finds himself as the adjutant to a colonel in the Waffen SS, Erich Himmel, and must not only protect his potentially mortal secret but survive the horrors of combat. To add to his conundrum, our young hero also falls in love with Colonel Himmel’s young French mistress, Gabrielle Belmont, who is also of “questionable” heritage. When Shtefan discovers that Himmel intends to escape from Germany’s inevitable defeat and enrich himself by robbing an Allied paymaster train, the boy plots to betray the colonel by stealing both his mistress and his fortune. Where did the inspiration for the novel’s story come from? SH: Much of the inspiration for the story came from my own background, as my mother and her family were all Austrians, some of whom, although Jewish or partially Jewish, served in the Austrian or German armies. However, the driving force behind the novel came from a recurring dream that I used to have as a child; it is a scene that figures prominently in the book. Who were the Mischlinge? Why has their story rarely been told? SH: The Mischlinge were Germans or Austrians of “mixed” heritage, meaning that somewhere in their ancestral backgrounds persons of Jewish faith had married into the family. During the Nazi era, German and Austrian citizens had to prove their “racial purity,” and Mischlinge were considered to be Jews and persecuted as such. However, exceptions were made in accordance with the requirements of the Nazi war machine, and many such persons were allowed to serve. For those who survived, such service was regarded as shameful, which is why very few of them have spoken out about their wartime experiences. Are any of the characters in the novel, in particular Shtefan or Colonel Himmel, based on real-life people or did you create them from whole cloth for the novel? SH: Shtefan is based, in part, on my great uncle, Alexander, who served in the German Luftwaffe until he was discovered to be a Mischling and sent to a concentration camp. Colonel Himmel is based on a figure who used to appear in a childhood recurring dream; I do not know his origin. Many of the other characters are compilations of soldiers I have known personally, of various nationalities (soldiers are very much the same, everywhere). Gabrielle is based on a long lost love. You say in your historical notes at the end that some of the Mischlinge ended up in the Israeli army after the war. You have worked with Israeli Intelligence. Did you ever meet any of these men who shared their stories with you? SH: I did in fact meet a number of men who had served for a time in the German army, then escaped or fled and made their way to Allied lines and wound up in Israel prior to its post-war independence. Most of these men were already aging and no longer serving in the Israeli army, though some had been commandos and intelligence agents during their youths. What sort of historical research did you need to do before you wrote the novel? SH: Having grown up around men and women who lived through these times, as well my own family’s history and heritage, in truth I did not need to do much research. Once I completed the manuscript, I carefully fact-checked to make sure I’d gotten things right, but for the most part the details were already accurate. You have a strong military background, and there are aspects of The Soul of a Thief that tap into your knowledge. Would you classify the story as a war story first and foremost? SH: I would not classify the novel so much as a war story, but rather as a story that takes place during a war. I view it more as a coming-of-age adventure with a powerful romantic essence. You have written other novels. Is this the first set during World War II? SH: Yes, this is my first novel set during World War II, although it will not be my last. Want to win a copy of The Soul of a Thief? Share in the comments what your favorite book about World War II is for your chance to win! Giveaway: Answer the above question for your chance to win! Open to residents of the US and Canada, excluding Quebec. Contest closes March 27, at 11:59 p.m. ET. One (1) winners will be selected from all on March 28. For full official rules, click here. I loved Winter Garden and Nightingale both by Kristen Hannah. The last WWII book I read and thoroughly enjoyed was The Girl from Krakow by Alex Rosenberg. It told the story through the point of view of an average Jewish woman forced to make unimaginable decisions to not only save her life but the lives of those she loves. You can check out my review. Of the book on Goodreads. I would be thrilled to read and review this new WWII story. I have many favorite WWII books. Sarah’s Key, The Nightingale, Number the Stars, The Book Thief. I loved the Nightingale by Kristin Hannah , and Those Who Saved Us by Jenna Blum. Thank you for the chance ! My favorite book is My Mother’s Secret by J.L. Witterick – absolutely loved it! Code Girls was my favorite and I’d love to win this book! My favorite fictional WWII book is All The Light We Cannot See. Nonfiction is D-Day. My favorite is The Nightingale by Kristin Hannah. So many tears! Winds of War is my favorite WW2 book. Hmmm… favourite probably would be The Book Thief. I would say so far I loved the Nightingale by Kristin Hannah, although I’ve heard All the Light We Cannot See is phenomenal also. I would love to read this book. My favorite is a non-fiction from a few years ago. The Damned Engineers by Janice Holt Giles. Thanks. Id love to win the book sounds fantastic. My favorite book of war was Winds of War. City of Women is my current favorite. Looking forward to reading this! So many! Probably The Reader or All the Light We Cannot See. My favorite would be All The Light We Can Not See. Would love to read this one! Most recent one read would be Lilac Girls but I have several favorites based during WWII. Boom Thief my favorite WW1 novel. SO many possible answers! At the moment I’ll say The Book Thief, but ask me tomorrow and you might get a different answer! I love WWII books. Lilac Girls being the one I’ve most recently read. Lilac Girls is my favorite WW2 era book, exploring the lives of 3 women, an American, a German, and a Polish girl, each from their own point of view, as their lives eventually intersect during this time. I have so many World War 11 favorites, but A Scarlet Sky was memorable, and The Baker’s Daughter was unforgettable as was Sarah’s Key and Lilac Girls. Thanks for this wonderful giveaway. I have loved quite a few books about World War II but if I have to choose one it would probably be The Book Thief. Hoping to win this one – fingers crossed! My favorite book about WWII is The Alice Network. Many well loved books set during WWII – The Book Thief, The Wall (by John Hersey), The Devil’s Arithmetic. Hard to choose just one. I loved the Nightengale but also the Lilac Girls. Like others I have many favourites but of recent reads would have to go with The Nightingale (just starting The Saboteur); I really enjoy historic fiction as you can always learn something. I enjoyed The Book Thief very much. The Nightingale was excellent. I purchased it for my family to read! So many wonderful books, I can’t pick one….Unbroken by Laura Hillenbrand, Night by Elie Wiesel, The Nightingale by Kristin Hannah, The Book Thief by Markus Zusak and the Boy in the Striped Pajamas by John Boyne. I would love to add The Soul of a Thief to the list. My favorite WWII book is All the Light You Cannot See. I would love to read this. The Soul of a Thief is a great title! My favorite book about World War II is actually right after the war when the Allies occupied Germany, THE GOOD GERMAN by Joseph Kanon. Don’t judge the book by the movie, which stinks. The book is very good, and the movie is quite different. Patton and His Third WWII Army! One of my favorite WWII historical fiction titles is All The Light We Cannot See by Anthony Doerr. Phenomenal story! I’m fond of Anthony Doerr’s All the Light We Cannot See. I’d love to win a copy of The Soul of a Thief, too. Thank you for this opportunity. My favorite book set during WW2 is The Diary of Anne Frank. I love to read anything that has to do with WW2. My favorite book is A Thread of Grace by Mary Doria Russell. If you haven’t read it, check it out. You won’t be disappointed. The Lilac Girls, and The Nightingale and All the Light We Can Not See. Also, Suite Francais – so heartbreaking. Would love to win a copy. I do love books set in WWII. The Diary of Anne Frank was my introduction to literature from that period and I also loved Sarah’s Key. currently reading The Librarian of Auschwitz, liked The Reader and of course, The Rise and Fall of the Third Reich. I have a few recent World War II favorites including The Nightingale, The Lilac Girls and Alice’s Network. I have read and loved many books about World War II. Probably my favorite is the children’s book Rose Blanche by Roberto Innocenti. Highly recommend you read it. Band of Brothers by Stephen E. Ambrose. It is an amazing book. My dad was a WWII Medic in the same areas as the setting of this book. Right now, my favorite is The Zookeeper’s Wife. This is a difficult question. An immediate response would be All the Light We Cannot See but there is a close running with Kanon’s The Good German and Leving Berlin and on the otherside of the world, Unbroken. The Book Thief is one of my forever fav books! OH The Book Thief for sure!! The Jersey Brothers, The Paris Architect, Inside the Third Reich – With degrees in history, I like them all! Hard to pick one. Munich sitting on book shelf waiting to be read. Maria, I’m probably not supposed to reply to these comments, but I have to agree about Deighton! Did you ever read “Winter”? The man’s a brilliant writer. Favorite WWII story? I’ve narrowed it down to three: Shoes for Anthony, EMMA KENNEDY; All the Light We Cannot See, ANTHONY DOER; A Town Like Alice, NEVIL SHUTE. And your novel sounds like it could join the pack. Someone who has read Nevil Shute! Terrific author I read a lot of so many years ago! Picking out my favorite book about WWII is trying to pick out highlights in a bonfire as their is so much out there. That said, I think my favorite non-fiction work on WWII is AN ARMY AT DAWN by Rick Atkinson. My favorite work of fiction on WWII is A THIN RED LINE by James Jones. Looking forward to having Steve’s new book claim the top spot. Such a relatively untapped subject deserves special attention. Best of luck Steve! Unbroken by Laura Hillenbrand is my all time favorite book about World War II. I love World War II fiction but Louis Zamperini’s story really touched me, I recommend this book all the time. The Nightingale by Kristin Hannah was an excellent read. One favorite – how do I choose? I loved Those Who Save Us, The Hiding Place and Sarah’s Key, but if I could only keep one on my shelf, it would probably be The Garden of Letters. Hopefully, I never have to make that choice. This book looks like a must-read for those of us who love WWII literature! by Jackie Copleton which covers Nagasaki. The Paris Architect is my favorite novel that takes place during WWII. Books by Andrew Gross “The Saboteur” and “The One Man”; couldn’t remember them last week- senior moment! As I read the previous responded I loved and read every book. They were all my favorites. So I am not able to just say one. WWI and WWII are my favorite era to read. I would love to read your book to root the young man forward to thwart the Nazi.